We welcome all types of feedback about your experiences with Yooralla. Complaints: We want to know when you’re not happy about an experience you’ve had with Yooralla. A complaint can be about a person, a service or something you have experienced. We will respond to any complaints received within three working days. How can I provide feedback to Yooralla? Speak to your Yooralla site manager, service delivery officer or support worker. Call the Customer Relations Team 03 9666 4500. Complete the Your Yooralla experience feedback form. 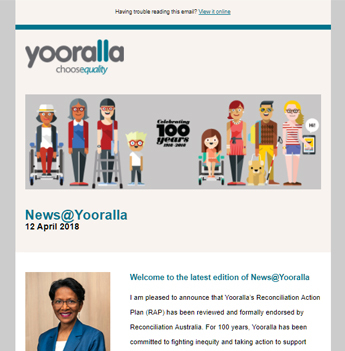 Hard copies are available at all Yooralla sites or you can download a copy. Complete an easy English feedback form. Hard copies are available at all Yooralla sites or you can download a copy. Fill out the ‘contact me’ slip, available at all Yooralla sites, and return to Yooralla in the reply paid envelope provided. If you are not happy with our response you can escalate your complaint to an external agency. Department of Education and Early Childhood Development: The department offers learning and development support, services and resources for all Victorians, from birth through to adulthood. You can visit their website or phone 03 9637 2000. The Complaints Resolution and Referral Service (CRRS): A complaints resolution service for people using Australian Government-funded disability employment and advocacy services. You can visit their website or phone 1800 880 052. Office of the Public Advocate: The (OPA) promotes the rights, interests and dignity of people with disability (specifically intellectual impairment, mental illness, brain injury, physical disability or dementia) living in Victoria. You can visit their website or phone 1300 309 337.